The use of composites is growing in structural applications in many industries including aerospace, marine, wind turbine and civil engineering. There are uncertainties about the long term performance of these composites and how they will perform under cyclic fatigue loading. Fatigue life prediction of composites and composite structures provides a comprehensive review of fatigue damage and fatigue life prediction methodologies for composites and how they can be used in practice. After an introductory chapter, Part one reviews developments in ways of modelling composite fatigue life. The second part of the book reviews developments in predicting composite fatigue life under different conditions including constant and variable amplitude loading as well as multiaxial and cyclic loading. Part three then describes applications such as fatigue life prediction of bonded joints and wind turbine rotor blades as well as health monitoring of composite structures. 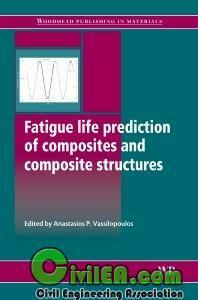 With its distinguished editor and international team of contributors, Fatigue life prediction of composites and composite structures is a standard reference for industry and researchers working with composites and those concerned with the long-term performance and fatigue life of composite components and structures.